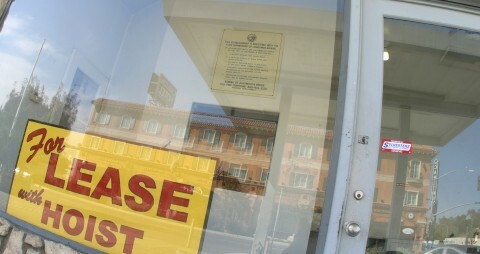 Are city officials in Atascadero using unethical and potentially illegal threats to force out downtown property owners? 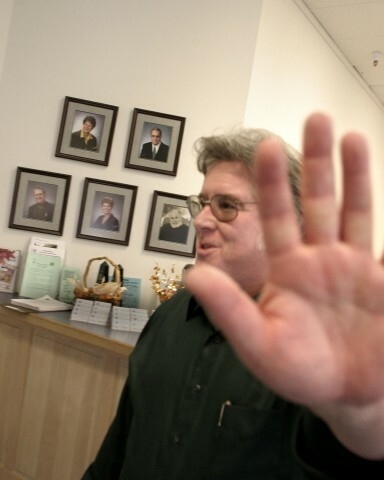 In a David-and-Goliath-like scenario, some Atascadero city officials are apparently using the threat of eminent domain to intimidate some property owners into selling their land to the city for a below-market price. And the property owners are wondering to what lengths the city and its redevelopment agency will go in the name of enhancing its downtown. Just ask Pat and Sue Gaughan, who own property at 6040 El Camino Real, across the street from the newly renovated Carlton Hotel. The Gaughans, who live in the hills above Atascadero, have owned the El Camino Real location since 1985. Pat ran an auto shop there until he retired in 2004, and says that he planned on living off the income he would make leasing out his property. But that's not going to happen. The Gaughans are now trying to sell their property, but not to the city. In July of 2004, the city's redevelopment agency offered the Gaughans $1.1 million for their property. They turned the city down because they felt the offer was too low. In November of 2004, the Gaughans leased their auto shop to Damian Shipeela, the owner of Landis Automotive in San Luis Obispo. Shipeela moved in equipment and staff, put up a sign, and opened for business. "Pat, Sue, this is Marty Tracey from Atascadero. I want to give you a heads up. The City Council last night sitting in the redevelopment agency in closed session has directed staff to move forward with an eminent domain process on your property there across from the Carlton. "I hate to be the one that tells you this, but I wanted you to hear it from me, before you get letters from the city attorney and stuff like that. So, I don't feel good about this, but I would like to talk to both of you about it and what the process would be ... not to advise you, but just to answer your questions. "So if you give me a call back at your earliest convenience, maybe we can set something up, meet me here, or I'll meet you wherever you want to. I'm at 461-5000, extension 3460." I HAVE NEVER DONE SUCH A THING: Martin Tracey, Atascaderos executive deputy director of redevelopment, says he did not leave the phone message, and claims "[the city has] no intention of taking any properties by eminent domain." #Martin Tracey is the executive deputy director of the city's redevelopment agency. He denies ever leaving that message. "I have never done such a thing," Tracey recently said when asked about the call. New Times has a copy of the message left on the Gaughans' answering-machine tape, and Tracey has repeatedly declined New Times' offer to listen to it. But Atascadero city manager Wade McKinney confirms that it is Tracey's voice on the tape. First, the city has not started any eminent domain proceedings on the Gaughan's property, so says Atascadero City Attorney Patrick Enright, along with two City Council members and Mayor Wendy Scalise. Second, according to California law, as well as Tom Hart, the deputy director of the California Redevelopment Association, it's highly illegal for a redevelopment agency to discuss eminent domain during a closed session. It violates the Brown Act. Eminent domain gives government bodies the power to take private property without the owner's consent. It is normally used to complete a public project, such as a road. But Steve Greenhut, a reporter for the Orange County Register and the author of "Abuse of Power," a book on eminent domain, said that cities have been known to use the threat of eminent domain to pressure landowners to sell at lower-than-market prices. Because the Gaughans' property had once been a Texaco station in the early 1980s, the city in May of 2004 had asked the Gaughans if they would agree to a phase one environmental study on the site to determine if there was a history of possible contamination. The Gaughans agreed. When the city offered to buy the Gaughans' property in July 2004, one of the conditions of the sale was a phase two study, a more invasive probe that requires physical samplings of the land. In that the Gaughans had rejected the offer on their property, that study seemed a moot point. But the city, still interested in the property, pressed on for phase two. When the Gaughans refused, the city used the excuse of eminent domain to gain access to their property. It came in the form of a letter dated March 7, 2005, sent to the Gaughans from City Attorney Patrick Enright's Sacramento-based law firm, threatening that the redevelopment agency would obtain "court-ordered access" if the Gaughans didn't allow a phase two study. The letter cited California eminent domain law as the reason the agency had the right to further test the property. On April 27, Enright's firm filed a court petition that allowed the agency access, because according to the document, "The Agency is analyzing the possible acquisition of the Property for municipal purposes." Explains Enright: "This is the wording used during eminent domain procedures, and in the future the city could consider enacting eminent domain." Roy Ogden, the Gaughans' attorney, is disturbed by the city's justification for the test. "If they were not going to take the property by eminent domain, it is in bad faith to use eminent domain to get on the property to run tests," he said. Corey Walsh, with the Regional Water Quality Control Board, which conducted testing on the Gaughans' property, said, "In the past, court-ordered phase two studies have been ordered during eminent domain proceedings. "I have never seen it happen without it." Executive Deputy Director Tracey denies that the city was going to start legal proceedings. "We have no intention of taking any properties by eminent domain," Tracey said when asked if redevelopment was using eminent domain to procure the Gaughans' property, "though we would like to purchase the property. We are planning on putting a city parking garage on the site." But Atascadero Mayor Wendy Scalise told New Times that the Council has not approved plans to turn the Gaughans' property into a garage. "There are currently no specific plans for that property," she said. But there are plans for redeveloment ... big plans. The Gaughans' downtown property is in the middle of the city's redevelopment area and approximately half a mile away from the proposed Colony Square development, a "living, shopping, and entertainment village" that a group of private developers envision as a new town square for Atascadero. Visions include a multiplex theater, restaurants, and retail stores on the ground floor, with residences and offices on the two upper levels. According to Atascadero's redevelopment plan, the city can eliminate "incompatible land uses" - such as auto shops and thrift stores - in the downtown redevelopment area, and promote new development. When a redevelopment agency uses eminent domain to procure property, state law says it must have a relocation plan for the owner and tenants. But state law is unclear as to when it's legal to use eminent domain as part of a redevelopment plan. Tom Hart, with the California Redevelopment Association, said the purpose of redevelopment is to improve the conditions of a city through urban revitalization programs. Author Steve Greenhut said redevelopment can be especially attractive to city councils due to the increases in tax revenue that can occur when a small business owner is pushed out in favor of a large corporation. CUTTING HIS LOSSES: Damian Shipeela, who was leasing the shop on the Gaughans property, says the city "made it very clear" that they would use eminent domain to claim the site. Though he had already spent $100,000 starting his auto shop business, he closed down in early 2005 - a few months after he had opened. #Gaughan's tenant Damian Shipeela is no longer in business. He closed down in early 2005, a few months after he had opened. In a letter to the Gaughans, dated May 25, he wrote that the city made it very clear that it would use eminent domain. "First the city issues me the license [for the auto shop]," Shipeela said. "Then Marty Tracey tells me he would be surprised if I would be there for more than a year." Shipeela said he had already spent $100,000 starting his business on the Gaughans' property in Atascadero, but decided to get out before he lost even more. "The city was ethically and morally wrong," Shipeela said. "I was incredibly angry." By now, word was getting out that the city might use eminent domain to procure other properties that were not compatible with the city's master plan. "The city informed us [in a public meeting on redevelopment plans] that they don't want thrift stores in the downtown area and that it would just be a matter of time," said Donna Porter, manager of the North County Christian School Thrift Shop Mall. "If they close us down, a lot of people will be hurt." The thrift shop supports the Salvation Army, Loaves and Fishes, and women's shelters. According to Atascadero's redevelopment plan, property owners are "to be given the opportunity to participate ... by developing or improving such property." The Gaughans had asked the redevelopment agency to allow them to participate in the redevelopment of their property, but Martin Tracey said no. "Not at this time," Tracey said when questioned if he was considering working with the Gaughans. But City Attorney Enright said just the opposite: "The city is prepared to work with any property owner in the development area." The Gaughans have recently been approached by a private developer who's interested in buying their property, and they've discussed an undisclosed selling price that they say far exceeds the city's last offer. That may be good news, but the Gaughans are still concerned. The phase two assessment of their property found higher levels of benzene and petroleum hydrocarbons than were acceptable for drinking water. But Corey Walsh with the Regional Water Quality Control Board said because the groundwater is not part of the city's drinking water, "I don't see our agency requiring cleanup. The levels are too low to need cleanup." Nonetheless, the Guaghans' potential buyer-developer has put limitations on the sale because of fears that the city might hold up construction due to any kind of chemical contamination. And the Gaughans fear that city interference could ruin the deal. "It penetrates us," Pat said of the situation. "Sue and I are always on edge. It's the bouncing back and forth and the time spent with attorneys and the city." Last week, the city made a new offer of $950,000 to the Gaughans. A smaller property with a boarded-up building across the street is currently on the market for $1.5 million. When asked about the low offer, Scalise used the reported contamination as a reason for the decrease in price. She said she was not aware that the currently reported levels are not high enough to require cleanup. In leaving his message behind, Martin Tracey may have something to answer for. When New Times played the tape for Mayor Scalise, she wouldn't comment as to the caller's identity. But she did say when asked about the call, "Clearly if any member of our staff is doing something wrong they will be dealt with." City Attorney Enright listened to the tape, and told New Times: "I don't think Marty Tracey is in closed sessions, because I am, and I don't think I've seen him there. The Council has not moved on eminent domain proceedings in closed or open session." When asked what action would be taken because of Tracey's threats, Enright said he would contact the man. But who is looking after Atascadero's Redevelopment Agency? All five members of the Atascadero City Council make up all five seats of the board. Tom Hart, of the California Redevelopment Association, said there is no state oversight board for redevelopment, though each agency is responsible for sending yearly financial reports to the state controller. "The administration and oversight is the responsibility of the board," Hart said. "In a lot of small cities, the council also sits as the redevelopment board. They are the ones that oversee the administration of the program." Intern Karen Velie can be reached through the managing editor at kharris@newtimesslo.com.